Mountains. Ocean. A giant city park. Laid-back vibe. What's not to love about Vancouver, especially with kids in tow? There's no shortage of things to do in Vancouver, and that's especially true if you're visiting Vancouver as a family. Vancouver offers plenty of family-friendly fun, from outdoor activities to indoor attractions geared towards children. More than merely a city park, Stanley Park is a comprehensive collection of attractions, water access, restaurants and vast green space easily accessible from downtown Vancouver. About 10 percent bigger than Central Park in New York City, Stanley Park juts out into the water, creating a glorious 5.5-mile seawall perimeter that is an accessible route for runners, walkers, bladers, and cyclists. Other Stanley Park attractions include splash pads, pools, beachfront, tennis courts, totem poles, the Vancouver Aquarium, and more. Families may particularly like to rent bikes or grab the hop-on, hop-off trolley car that operates during the summer months and offers a running history of the park. Granville Island is a success story of urban planning. Once a run-down industrial park, Granville Island is now a happening place that features a children's market, public market, an art school, shops, restaurants, theaters, galleries, a hotel, and more. Don't miss getting there or back or both by the colorful and inexpensive Granville Aquabus that will pick up and drop off visitors at various locations, including Yaletown and Science World. Whether you and your family want to do the grueling Grouse Grind and hike up the mountain (be sure to check details of the climb for it's not called the Grind for nothing!) or take the more leisurely Skyride, you will be rewarded with a spectacular view of Vancouver and the Pacific Ocean. The Capilano Suspension Bridge is more than just a bridge; there's a whole park packed with adventure, history, and culture for families to enjoy—and only 20 minutes outside of downtown Vancouver. 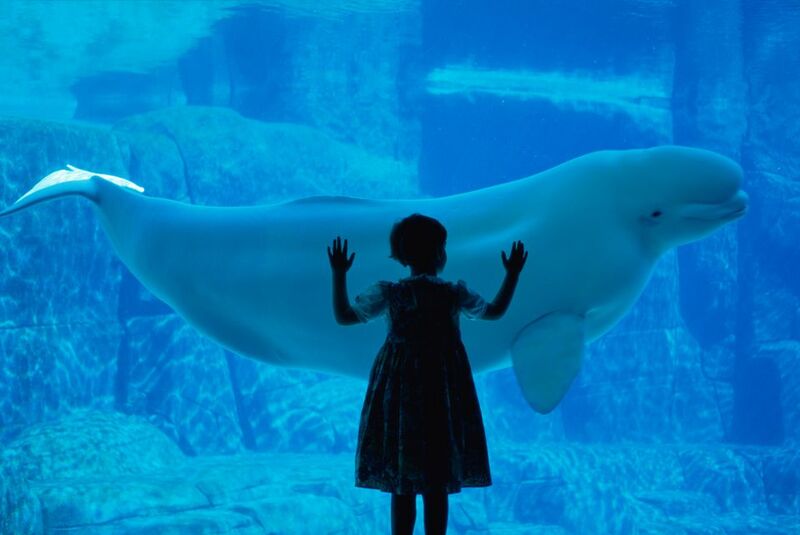 Kids will love the Vancouver Aquarium's shows that go on throughout the day (schedule will be posted at entrance daily), including sea otter feeds, beluga whale shows and various educational talks that are included in admission. The aquarium houses more than 50,000 creatures. Educating the public about marine life is a big part of the aquarium's mission, and profits from the Vancouver Aquarium go toward conserving aquatic life. Science World offers incredible exhibits, interactive science demonstrations and other cool stuff that will make your kids say "Wow!" They'll be having too much fun to know that they're learning. Science World also has an OMNIMAX Theatre with movies that teach us about the world us around us, putting us right in the heart of the action. Just 10 minutes from downtown Vancouver, take a close-up look at 200 farm animals and birds and pet bunnies, horses and goats. Maplewood is a working farm, so visitors are treated to milking demonstrations, sheep shearing and more. Admission is minimal, parking is free, and families can easily enjoy two to three hours at the farm. What better way to explore Vancouver with kids than on the Hop-on, Hop-off Bus. In good weather, the vintage double-decker vehicle is open to the elements as you travel among the more than 20 stops on the itinerary. Hop on and off throughout the day to see all of Vancouver's top attractions or stay on for one 90-minute ride. Your bus ticket is good for either 24 or 48 hours. Why is a fast-food restaurant on our list of things to do with kids? White Spot restaurants are somewhat of a provincial treasure in BC and very kid-friendly. Since 1928, White Spot restaurants have been serving up their patented and outrageously delicious Triple "O" Burgers and fresh-cut fries (what fast-food restaurants still serve fresh-cut fries?). Today, the menu has expanded to include salads, AAA steaks, BC chicken, pasta, and stir-fries. Vancouver is surrounded by water, so why not take advantage of it. Enjoy one of the half-dozen beaches or the giant outdoor pools at Second Beach in downtown Stanley Park or at Kitsilano Beach just a few minute car-ride away. Both offer the joy of swimming outdoors in heated ocean-fed pools that are safe for toddlers and adults alike. Are your kids interested in water sports that are a little more challenging? Kayaking, windsurfing, and rafting are popular options as well. Once an industrial wasteland, Granville is now a family-friendly island packed with fun things to do. It's just 10 minutes from downtown and is home to a buzzy waterfront courtyard (usually featuring free musical entertainment), a public market with all kinds of vendors), and docks with houseboats and fisherman—a delight for any kid to explore. This unique museum was actually built around the St. Roch, a historic ship that was the first ever to sail the Northwest Passage. Kids can see the captain's quarters and even take a turn at the wheel. Outside of the museum, visit the resident ship-builder and the boats docked at the water's edge. Older kids will enjoy the Museum of Vancouver, which offers a glimpse into the city's history. You can visit a recreation of an old home and discover the souvenirs and artifacts of the explorers who founded the city. Temporary exhibitions often include historical looks at Canada's native people, like the Haida. Visit the British Columbia Sports Hall of Fame to learn about the history of sport in the province and relive some of the most exciting moments from the 2010 Olympic Games. This little-visited museum is home to the Olympic podium where the Canadian men's short-track speed-skating team received their gold medals, as well as fascinating historical displays about Canadian athletes like runner Terry Fox and race car driver Greg Moore. Head to Vancouver's outskirts for the unique Sea to Sky Gondola. Set overlooking the town of Squamish, a trip up the 2,900-foot gondola gives visitors incredible views of Howe Sound, Shannon Falls, and the surrounding alpine landscape. Once you've reached the top, you can walk across the Sky Pilot Suspension Bridge or walk the Alpine Alley, a nature walk just for children.